Green Lantern has been unwillingly recruited by the Blue Lanterns after being rescued from the Red Lanterns (if you haven't read Green Lantern comics in a while this can be confusing). 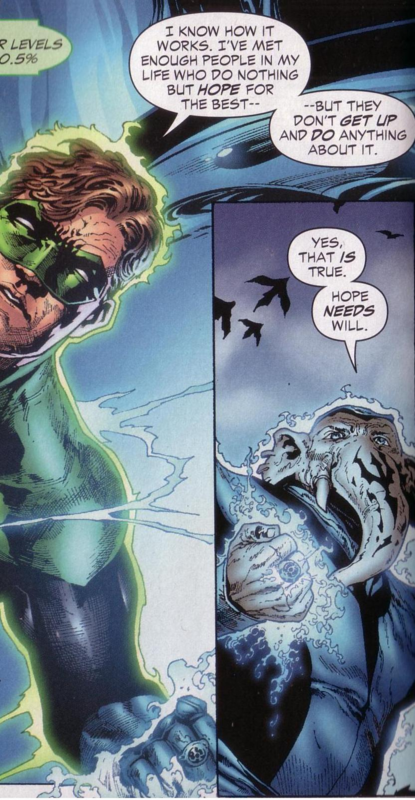 The Blue Lantern is fueled on hope but Green Lantern believes that hope is nothing if one does not act to make ones hope a reality through willpower (which is what fuels a Green Lantern's ring). I found this to be a very enjoyable trade paperback which explored the Blue and Orange Lanterns and adds great backstories to the Guardians of the Universe. The artwork was extremely well detailed and brought to life the amazing locations these stories take place in. References: Taken from Green Lantern: Agent Orange (ISBN: 978-1-4012-2420-2) by Geoff Johns (writer) and Philip Tan (artist). Published by DC Comics.